Plenty of flavour and a luscious sauce are sure to make this quick shrimp dish a new favourite. Serve over jasmine rice or rice noodles with fresh cucumber slices on the side. In a large skillet, melt butter over medium-high heat; cook garlic, carrots, onion and hot pepper flakes, stirring, for about 4 min or until onions are softened. Add red pepper; cook, stirring, for 1 min. Stir in Cream and peanut butter; bring to a boil, stirring until peanut butter is melted. 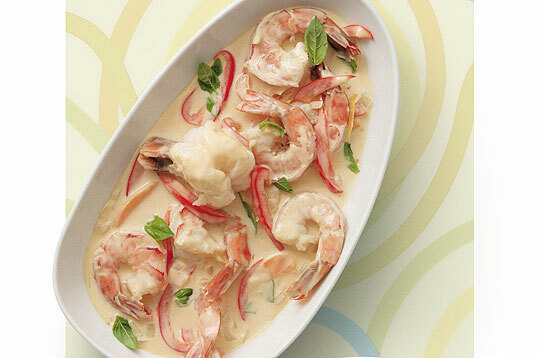 Stir in shrimp and simmer, stirring often, for about 3 min or just until shrimp are pink and opaque. Stir in orange juice, basil leaves and salt.